Stalybridge begins to grown and flourish. 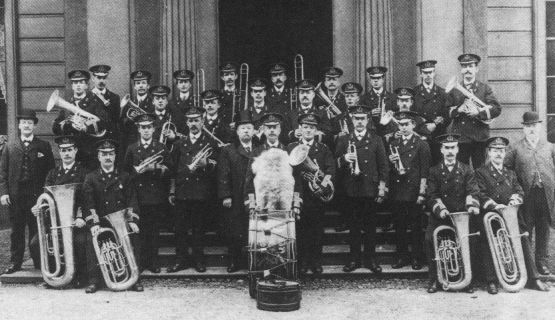 One of the main contributors to the town still continues to this day....Stalybridge Old Band. The band has a fantastic website that tells you more about how they have developed and what the future continues to hold for them. Stalybridge Town Hall viewed from Stamford Street. 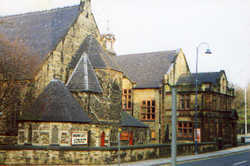 The Library on Trinity Street. Local Housing in the Castle Hall area. In 1809, the Stalybridge Old Band was established, and in 1823, the arrival of a Manual Fire Engine was presented to the town by the Phoenix Fire Office. In 1831, the Town Hall and New Market were commissioned by Proclamation and the first satisfactory census was taken. The population was 14,216 and inhabited houses - 2,357. In 1838, foundations stones were laid for the churches of St. Paul's, Stayley, St. George's, the Hague and St. Peters Catholic Church. The Holy Trinity Church laid its corner stone in 1851, and in 1861 the Congregational Church opened. The Congregational Church on Trinity Street has now relocated to Baker Street, just off Acres Lane. The site is now new housing. View of Cocker Hill with Old St. Georges church overlooking the town. 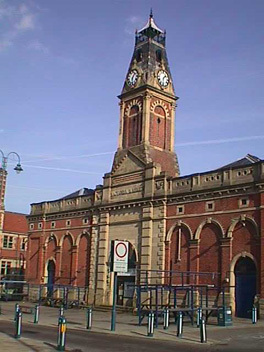 The Victoria Market Hall - now the Civic Hall, located in Lord Pendry Square, on Trinity Street. The Old Fire Station pictured with horse-drawn manual pumps and firemen. Local artist's impression of the Town Hall, as viewed from Corporation Street. In 1868, the New Victorian Market Hall opened, and the foundation stone for the Public Swimming Baths was laid by Mr. Robert Platt. 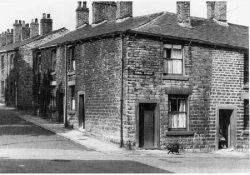 The Slipper Baths were used by the local community for personal washing as many homes did not have any internal bathrooms, so local people would go along and pay and use the facilities. This was still in use in the 1970's. The Iron Bridge over Melbourne Street opened in 1834, and in 1867 the Victoria Bridge from Market Street to Trinity Street was erected. In 1870, the first brass band contest was held in Stalybridge. 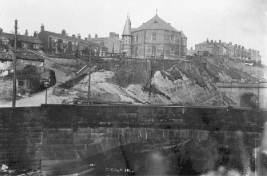 Water from the Brushes reservoir began to supply Stalybridge and Stamford Park opened in 1873, with the opening of the boating lake to follow in 1894. 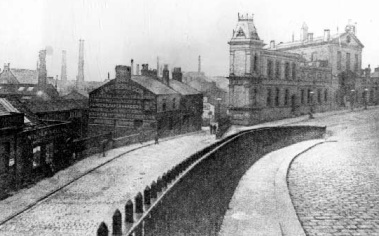 In 1881, the laying of the first tramways to Ashton commenced, and horsedrawn tramcars first ran from Stalybridge to Ashton, the cost for the fare was 2d. (that was the currency used in the days before pounds and pence, also known as decimalisation). In 1901, the Astley Cheetham Public Library opened to the public and the General Post Office on Trinity Street opened for public use. In 1902, the construction of the electric tramways commenced. In 1905, the New Fire Station on Waterloo Road opened, and in 1910 the school on Waterloo Road opened. School Grey Street Playing Fields opened, along with Cheethams Park. In 1946, the town was visited by Their Majesties King George VI and Queen Elizabeth, and in 1955 and agreement was formed to link the two towns of Stalybridge and Armentieres.